Mt. 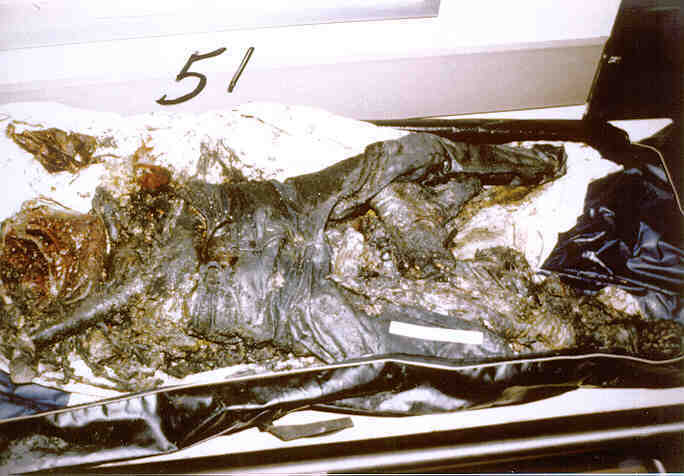 Carmel Doe 51: Autopsy photograph of the alleged remains of Judy V. Schneider. According to her autopsy, Judy died of "suffocation due to overlay and burial in structural collapse." According to the autopsy report, Judy's remains had no skull, neck, or upper spine. And as will shown, the area suffered little or no "structural collapse." Its a pity Dr. Peerwani's courtroom testimony at the 1994 San Antonio trial of the Branch Davidians was not logically examined, and then compared with the content of the Autopsy Reports his office produced. Much could have been learned. In The Locals Speak we saw defense attorney Tinker and Dr. Peerwani paint of picture of parents taking children into the concrete room and covering them with sleeping bags, blankets, etc., to protect them from the C/S gas. Nor do the Autopsy Reports support the picture painted by Mr. Tinker and Dr. Peerwani. The corpse of Joseph Martinez, eight years old, (Mt. Carmel Doe 52) came to the morgue in a body bag which contained a pillow case lining; the corpse of Rachel Koresh (Mt. Carmel Doe 67-3) came to the morgue in a body bag which contained a fragment of table cloth; the corpse of Hollywood Sylvia (Mt. Carmel Doe 67-4), one year old, came to the morgue in a body bag containing a baby's quilt; and the corpse of Mayannah Schneider (Mt. Carmel Doe 70), two years old, was delivered to the morgue with debris that contained a charred blanket. This is scant evidence upon which to base a scenario concerning the circumstances surrounding the deaths of 33 people. Dr. Peerwani said that some people were under sleeping bags and blankets, and when the concrete debris from the structural collapse fell on them they could not get air to breathe and died of suffocation. However, the Autopsy Reports indicate that many of those who died from suffocation due to structural collapse were found without heads. Look at the Autopsy Reports for Judy Schneider (Mt. Carmel Doe 51); "Martin Child" (Mt. Carmel Doe 61); Rachel Howell Koresh (Mt. Carmel Doe 67-3); Rachel Sylvia (Mt. Carmel Doe 67-6); Mayannah Schneider (Mt. Carmel Doe 70. Cyrus Howell (Mt. Carmel Doe 67-2), eight years old, was found without a head. The rest of his remains were shattered and charred. The cause of his death is listed as "probably suffocation due to overlie and burial in structural collapse (cannot rule out trauma to the head)." What happened under the sleeping bags and concrete rubble to cause suffocation victims to lose their heads? If the victims were buried under rubble, their heads would have been held securely in place. It is hard to image how the heads or bodies could been charred or burned off in any fire that might have broken out after the (non-existent) collapse, because fire cannot penetrate concrete. Unidentified Mt. Carmel 51A, died of both suffocation due to the structural collapse and smoke inhalation. Yet a skull was the only part of that young child ever found. What happened to the body under the sleeping bags and rubble? Further discussion of dismemberment will be found in an upcoming section, Dismemberment and Agglutination. Mayannah Schneider (Mt. Carmel Doe 70). The Autopsy Report for Aisha Summers, (Mt. Carmel Doe 31 A), found on the surface, was focally charred, not globally charred; Dr. Peerwani's testimony contradicted his Autopsy Report on this point as well. Inconsistent definitions of the terms "globally charred" and "focally charred" appear to have been used by those writing the autopsy reports. Dr. Peerwani appears unfamiliar with how the terms were used, unfamiliar with the conditions of the bodies, and unfamiliar with the reports themselves. But the larger question is this: How could a victim of burial under concrete be incinerated in the manner described? Dr. Peerwani mentioned that debris around the corpses was analyzed, and most of the Autopsy Reports mention debris found with the bodies. For example, the Autopsy Report of Julliete Martinez (Mt. Carmel Doe 54), mentions "construction debris including dry wall, fragmented glass and burned wood ashes and charcoal." But there is no indication that any attempt was made to study the debris and relate it to the recovery site. As we shall see in Eeenie Meenie Miney —DOE!, there is evidence that bodies were moved after death and before "recovery;" study of the debris could have thrown light on the original site of death and crime scene. The only debris subjected to study were the spent cartridges which were gathered up with the bodies and put into the body bags. See discussion following. There certainly is evidence that the coroners may have accommodated requests to look for certain types of injuries among the Branch Davidian dead. Many Autopsy Reports state that the remains bore "no signs of gunshot wounds." This statement suggests the coroners were asked to look for gunshot wounds and they accommodated the request. Autopsies are concerned with the cause and manner of death, and forensic experts look to the remains to provide evidence. Injuries that do not exist are irrelevant in an autopsy; there is no need to mention hypothetical non-existent wounds in a scientific report. At least another three state that gunshot injuries "could not be ruled out" (see Autopsy Reports of Mt. Carmel Does 63, 64, and 67-5). None of this inspires confidence in the Tarrant County Medical Examiners Office, and leaves a rational person questioning the validity of their other findings. But all of these problems with the Autopsy Reports and Dr. Peerwani's testimony pale in comparison to the next problem: The "bunker" did not collapse! During the following exhibits, the visitor may wish to refer to these reference pages: Anomalies in the Forensic Process, Chart of Human Bones, and Glossary of Medical Terms.